Ok, here is the Graflex open, it looks like the bellows is in good shape. Can anyone tell me how to know what the two lens are for...Doh I mean wide angle vs telephoto? As you can tell I have no clue about any of this. Thanks Bob, I did find on the link Eric Rose posted that the big lens is 150mm approx. I will check and see what the other two are. Very Cool...Thanks for sharing them..
Those of us who used the 4x5 during it's glory years preferred the 135mm as the normal lens. 150 could indeed be used as a normal but was a tad long for press work. Most of us also packed a 203 to 210 mm for head shots etc. They may not be valuable, in the sense of old collectible pretentious antiques, but they're valuable in terms of utility, aesthetics, and as family keepsakes. You can still shoot them, you know. The speed graphic is a great camera; I love using mine. I think yours might be a crown graphic though; similar. The telephoto lens is, well, a telephoto lens. It's a long lens for 4x5. You have a nice keepsake. Unfortunately, like old pianos, old cameras grow old very gracefully but aren't worth much. I have the same Yashika. I bought it slightly used many years ago for $125.00. It still works but now adorns the bookcase in my study. I recently bought a like new Brownie movie camera, in the original box with all paperwork, hoping it had some value. I got home and searched on e-bay only to find 10 of them on there with a high bid of $3.25. Thanks Michael, at one time there was a B&W darkroom in the house and I made some prints from old neg. from both cameras but just got the camera's last week. I think I will have my friend show me how to use them and at the least take a few shots just to say I did. I have not shot a frame of film in 10 years and then only 35 mm. You can shoot colour film and slide film with the yashica D as well. Any 120 film will work. If you live in a reasonably sized city you probably have a professional lab that'll process 120; just ask around. You can look at slides (e.g. velvia, ektachrome, etc) directly, or if you get negatives the lab can do prints for you or scans. TLRs are a lot of fun to shoot. And you really ought to use that graflex. Get some cheap 4x5 film and tray process it in the dark. Lots of hints at largeformatphotography.info (and the forum there, which should be linked on the main page). Not too long ago a 4x5 Crown Graphic in really nice cosmetic condition in good working order was worth about $300 (body only). The lenses, lens boards, etc., vary greatly in price with the better performers and rarer models fetching good money... some very good money. Do your research before you sell anything. The Yashica is one of the earliest TLRs made by Kayasara in Japan in the mid 1950s after the occupation was over. In those days most of the Japanese cameras were kinda copies of better European and American cameras except for the innards which worked in a manner of speaking but were far inferior in construction. The camera shown, the model A and the Yashica-MAT all resembled the famous German Rolleiflex and Rolleicord cameras of that era. The Rollei equipment started to be imported again (soon after the war) by Karl Heitz of New York. When the Yashica cameras started to show up in New York there was talk about suing Yashika for patent infringement and “passing off” but the look is as far as it went- beauty was only skin deep! Once the technicians opened the Yashica there was no argument of infringement. The mechanisms were built like mouse traps but they worked nonetheless and the BIG negative was very desirable to 35mm users. The larger format made up for some of the optical shortcomings and besides the camera shown went for a mere $49.94- the Rolleis were 10 times more on the average. I used the Yashika MAT-LM ($74.95) in high school and it worked well. The SPEEDGRAPHIC (well-actually a CROWN GRAPHIC) is indeed a classic. 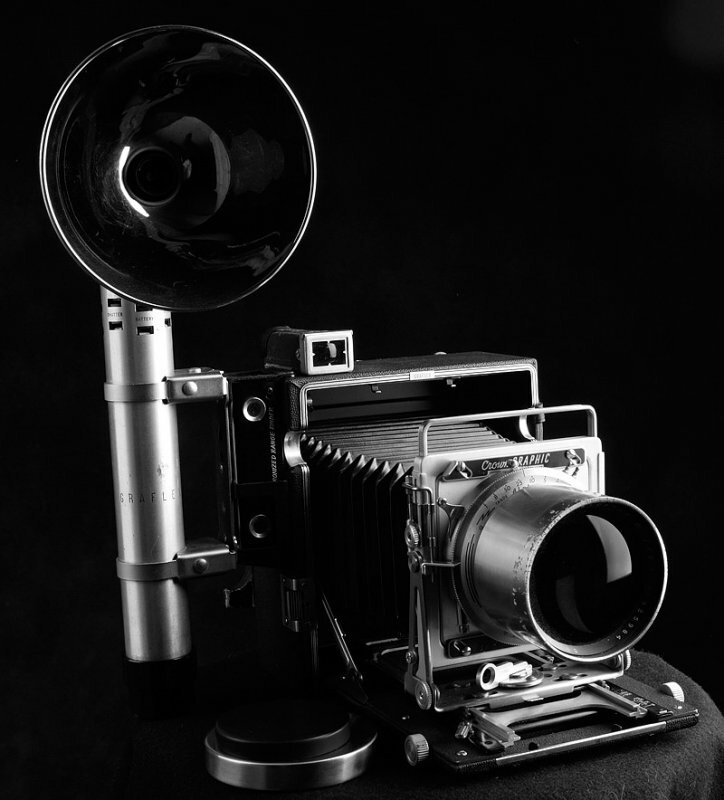 The model shown has the outboard Kalart rangefinder, the improved Graphex shutter, over the Rapex which was known to fall apart at high shutter speeds. Iy has the classic f4.7 Optar lens made by Wollensac. Notice the rugged bi-post synch terminal- much hardier that the PC types of the European shutters. The Graph-Lite flash holder is also a classic with its’ famous quick release encircling clamps and flat shoe mounted over the rangefinder. The flash holder was for expendable flash-lamps, the reflector shown is for Press5 pr Press-25 lamps- the was another reflector for the more powerful pres11s, 22s, 40, and 50,s. The flash holder also powered the solenoid mounted on the lens board enabling tripping the shutter from a micro switch on the flash holder. The other outlets were for extension flash holders. The Optar (normal) 135mm lens is cam-coupled to the rangefinder- the cam is located on the drop bed. I can’t ID the long lens- there were many portrait lenses fitted to those cameras but were not always cam coupled to the rangefinder- ground glass focusing was required. The Polaroid back show is totally obsolete in that the film has not been produce in many decades. A Fugi adapter can be inserted in the Graf-Loc back and Fugi instant film is still manufactured. The optical viewfinder has an insert mask to accommodate the 3x4 Polaroid back shown behind the camera. For full 4x5 film the insert is removed. The camera also features the classic wire sports finder. This camera (starting with the actual SPEED model) was the “Badge” of the professional press, sports, and wedding photographer from the late 1930s through the mid 1960s when smaller formats started to gain popularity. The view camera movements were somewhat limited and the normal lens did not have a large enough circle of coverage to accommodate even those limited movements- the 167mm or longer versions were better suited for that kind of usage. I don’t see the controls for the rear focal-plane shutter which went up to 1.000sec- thus the name SPEED-graphic! Many photographer had the rear shutters removed for safety purposes and preferred the full sych between-the-lens models. If this camera never had theses controls it may be an early CROWN model which was made sans the FP shutter. ON CLOSER EXIMINATION IR SAW THE DESIGNATION "CROWN" ON THE LENS BOARD. 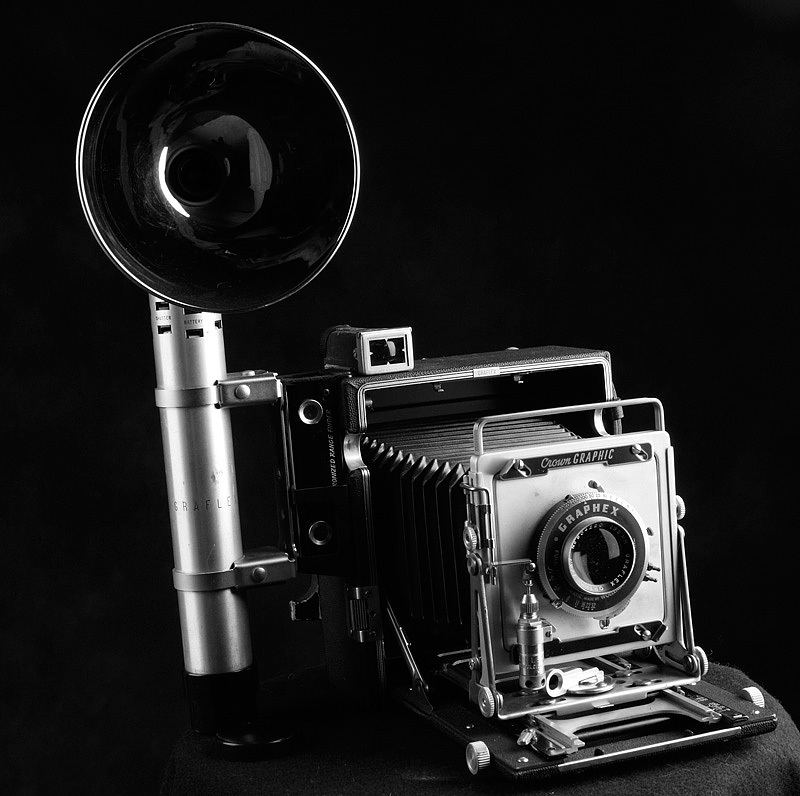 The later crwns had a Bakolite body rather than the leeather cover wood, featured a Schneider Xenar standard lens and was called the Crown Special, however the term "Speed Graphic" hung on untill the company stoped manufacturing all of their 4x5s sometime in the 1970s. The camera, as it is, can make a handy little field camera for those who like big negatives from a hand held camera with a rangefinder. The lenses of pretty decent at around f/8 and f/11.